Wooden stair parts, Newel Posts, Balusters, Newel Caps. Wooden stair parts: Newel caps, newel posts and balusters / spindles, can all be turned to your specific requirements or made to match existing in the timber of your choice.This is extremely useful where your project has existing stair components that need to be matched or you just require a few to replace your broken stair spindles or when adding a loft conversion and you want the new stairparts to match. Newel caps, in all shapes and sizes available. 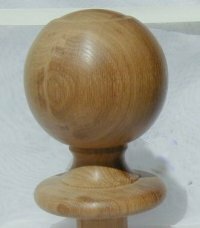 Turned wooden newel caps, newel posts and balusters/spindles can be purchased from a standard range. They can also be made to drawings, photo's or originals copied.